I love a good rock garden. You can ask my mother and she'll tell you I loved my grandmother's so much that I fell several feet off a high wooden staircase into her rock garden. I was knocked unconscious and ended up with horrible black eyes. My mom received judgmental stares at the grocery store for weeks, as my bruised and cut face caused strangers to gasp in horror. To this day, I sport a dent in my forehead that reminds me every time I look in the mirror the lengths to which I'll go to spend time in a rock garden. Nowadays, I'm a little safer about how I enter the yard and I'm slowly but surely putting in perennials throughout our property. I'm developing a rock garden proper at the front corner of the house and trying to border the back yard with Alaskan foliage. 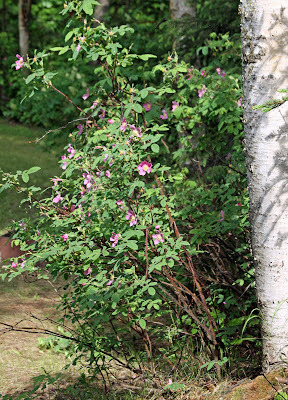 A couple weeks ago I showed you the arctic poppies, forget-me-nots, and mystery tree that have blossomed. This week, I've got a new batch of lovelies that are showing up. These Sitka roses greet me each morning when I look out the window. I can see them from my computer chair, and they remind me to limit my time on the Internet. but I think they're just as pretty in their own sweet way. When my neighbor, Peg, handed me a bunch of pots of green leaves, she called them day lilies. 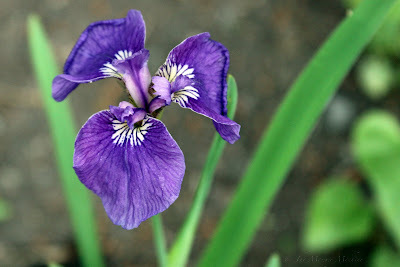 But this sure looks like an iris to me. Maybe an iris is a day lily. 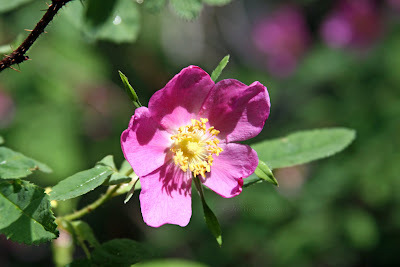 Or maybe this purple sweetie was just hiding out in the mix, since she was smaller than the rest yet the first to bloom. Or maybe I'm wrong and this isn't an iris at all. I guess I'll just have to wait and see what the others look like. 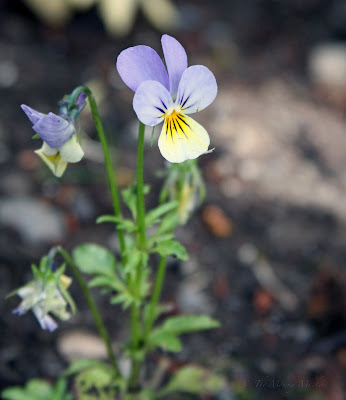 evidently some types of pansies are perennial. Yay! Then there's the love–hate relationship I've got going with my strawberry patch . . . they look so full of promise at this stage, don't they? We shall see if they deliver on those promises. 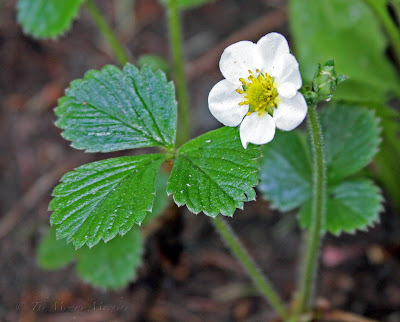 We have three lonely strawberry plants in our front yard. They've had a few flowers, and we spotted one or two fruits beginning to ripen. Then, as I sat there and watched, a chipmunk scurried in, plucked one of the two half-ripe strawberries, and ate it in front of my very eyes. Little rat. It looks beautiful! Those day lilies do look like irises....they're so pretty!!! Our strawberry plants are doing okay. We have some flowers, a few little strawberries but for the most part, let's just say I'm still buying strawberries from the store!! We moved into our home last fall, so I had no idea what flowers we had growing around here. I was delighted that the former home owner spent so much time planting perennials. I don't know how long you have had your strawberry plants, but I have heard it can take years for the strawberries patches to really take off. My grandpa planted strawberries and waited and waited years. Then, the summer after he died, they flourished. My mom picked them all that summer and cried her way through it. Your flowers look great! I am happy with mine so far, but really wanted to start some perennials and never got to it. Maybe bulbs in the fall. Anyway, sure can't complain about all this sunshine. My plants are growing fast!